I have fond, peculiar memories of a glass jar sitting on the fireplace mantle, holding a liquid that constantly reinvented itself. It changed by the day, by the hour sometimes, from something strange to something more recognizable. 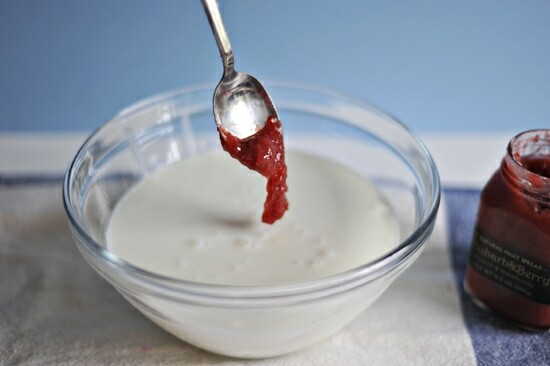 This liquid, as it turns out, is intensely good for you, a drinkable yogurt full of good bacteria, and even better when flavored at the breakfast table with fruit purees. 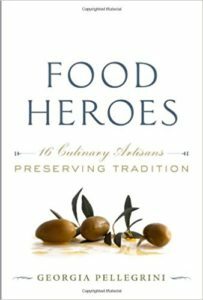 This is one of the recipes in my book Food Heroes. 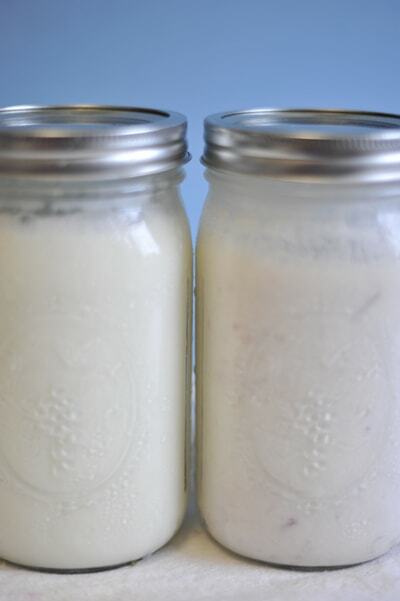 You can reuse the kefir culture many times as a starter before you need to begin anew: 2 cups of kefir from a previous batch will ferment 1 quart of new kefir. 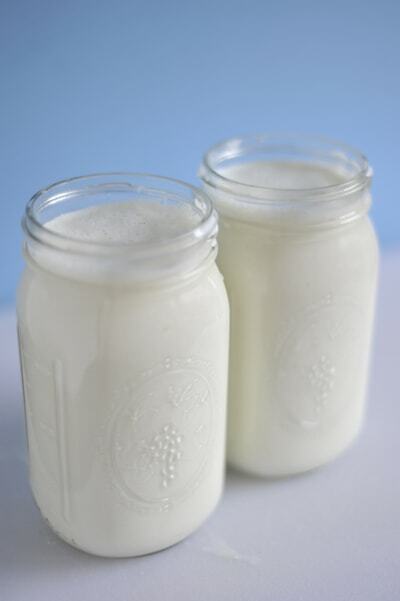 You can make kefir with coconut milk, rice milk, sheep’s milk, goat’s milk, or soy milk but it won’t get as thick as with cow’s milk. 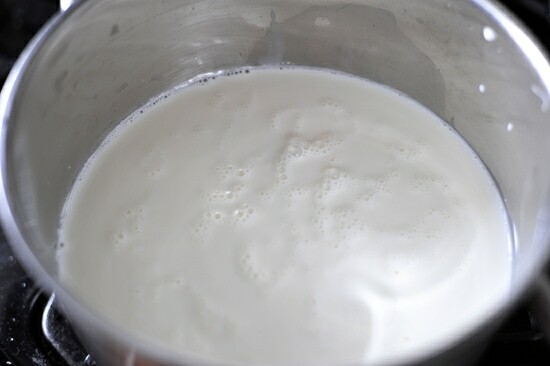 Add the milk to a pot and heat it until it just begins to bubble. Make sure to stir the pot often so it doesn’t scald. Bring the temperature down to to about 116 degrees F. If it is too hot, the heat will kill the good bacteria. 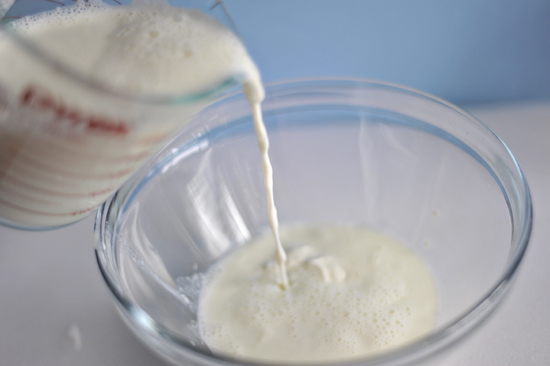 Pour the milk into the starter just a small amount at first. 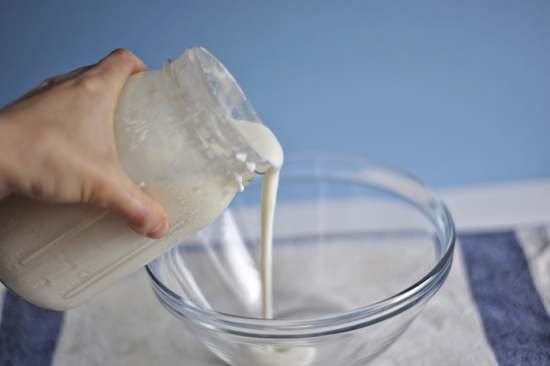 Whisk the small amount together with the milk. Then add the rest of the milk. 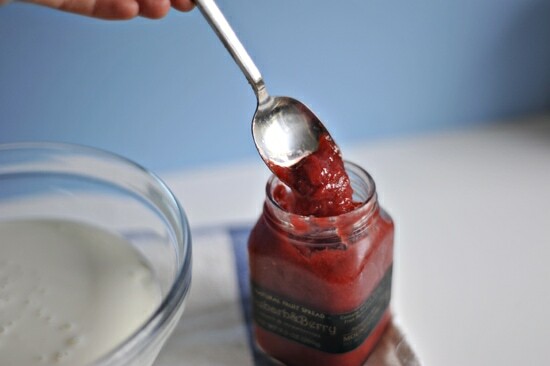 Ladle the mixture into glass jars with resealable lids suitable for storage. Close the lids loosely, not air tight. Then place them on a mantle or a ledge of your choosing. 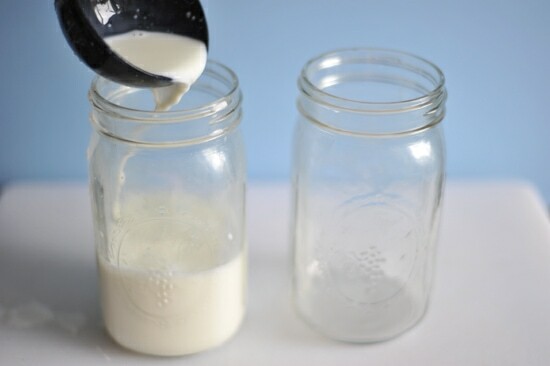 Putting them in the refrigerator will slow down the culture so wait to do this until the kefir has reached the desired consistency. Your favorite jam is the answer. Otherwise only flavor the amount you plan to drink, since it will spoil much more quickly with the addition of fruit puree. Give it a nice stir. And pour it all back in the jar. One plain, and one strawberry rhubarb… depending on your mood on any given morning. 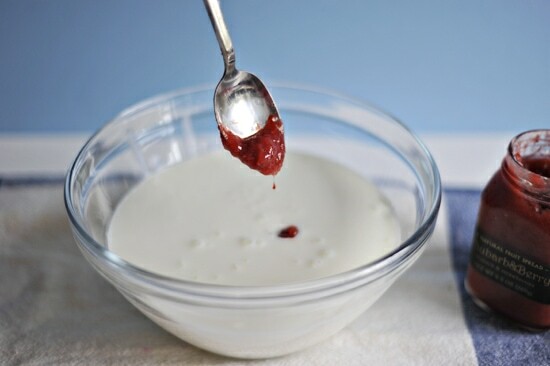 Have you ever made your own yogurt or cheese? Or experimented with food bacteria? 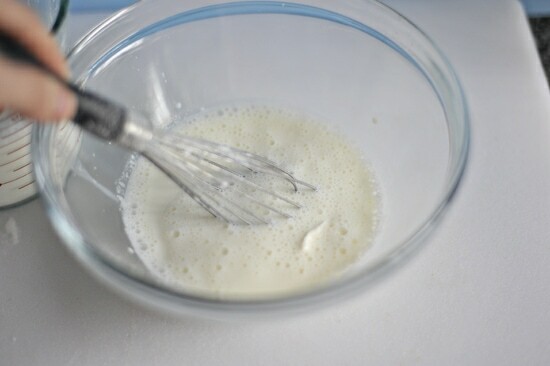 Heat the milk in a sauce pan until the surface just begins to foam, stirring often so that it doesn't scald. 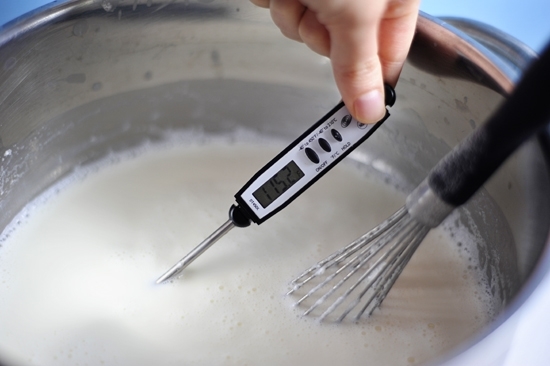 Remove from the heat and let cool to below 117 degrees F.
In a bowl, combine the starter culture with 1 cup of the milk and whisk together. 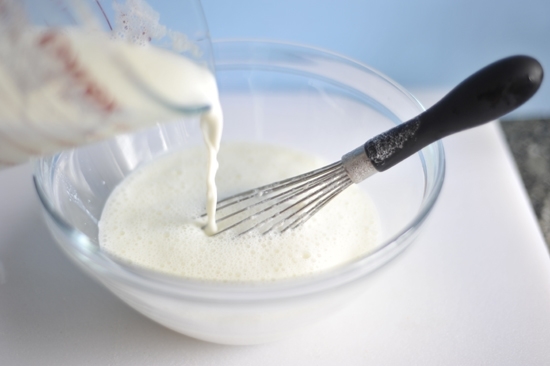 Then whisk in the remaining milk. Lade the mixture into glass jars with sealable lids. Seal the lids loosely, not air tight. Place the jar on a mantle or another ledge of your choosing and watch the change slowly begin to happen. 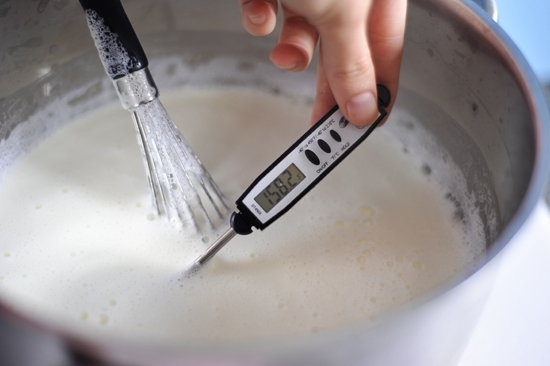 Time and temperature affect thickness and flavor of kefir. In warmer temperatures it may be ready to drink in 18 hours, in cooler temperatures it will take longer. Left too long at room temperature it will turn cheesy and sour, so finding the right amount of time is key. It should be creamy, like a drinkable yogurt, thicker than milk, with a sour perfume. Shake it well and refrigerate it once it has reached this pivotal state to slow down the culture. It can be store in the refrigerator for 12 months, and longer in the freezer. What is the purpose of heating the milk? 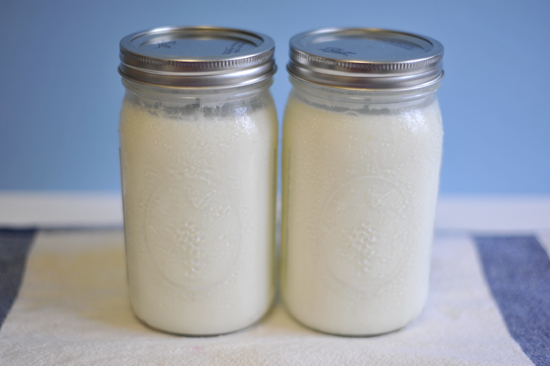 I've been making kefir for years and never heat it. 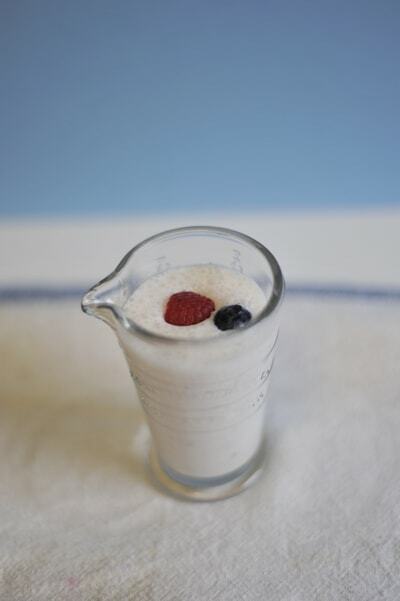 The best and most health-building kefir of all is made from raw milk with all the beneficial enzymes fully intact. 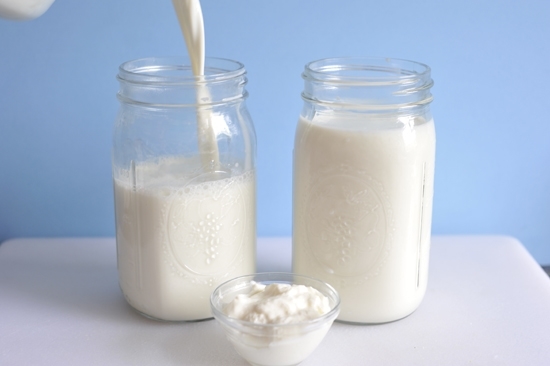 We always used the fresh milk still warm from our goats to make kefir but this year I found a source of raw cow's milk and made delicious kefir with that. There is nothing better! Actually the recipe in my book only heats it to the temperature of the skin. 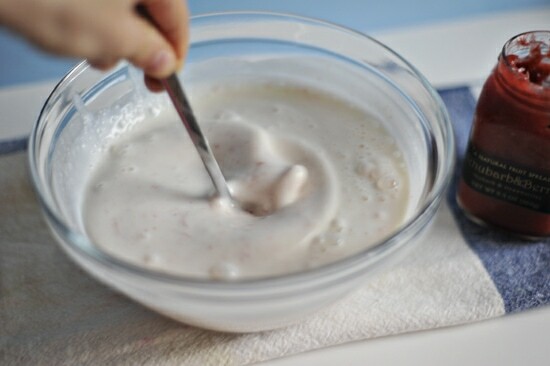 The heating method is used often for yogurt. The reason is to activate the bacteria but if it's just room temperature when you do it and it's worked for you then keep rockin on! 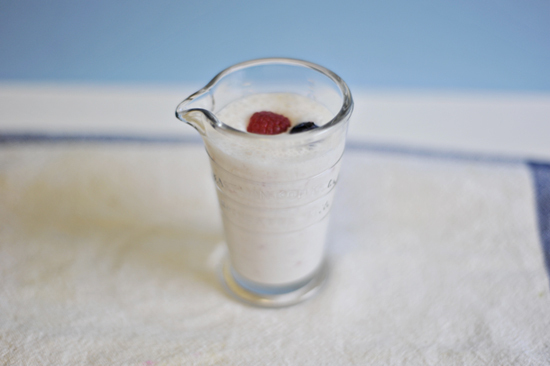 Sometime in the late '60s I was introduced to kefir. She didn’t know it, but I fell in love with her. On a cement crew the summer of 1971, a quart of her traveled with me to work. Unflavored, she and fresh peaches were my entire lunch. There was a hole-in-the-wall ‘health food’ store nearby where a stooped, hairless proprietor made the match. I kept her in a cooler with ice, so when the noon bell rang and it was 98 degrees, on the way to 107 or more, my gal kefir was right there chilling and waiting, for me! Oh, the faithfulness! Of course, lots of water washed across these pearly whites, passed through the oral cavity, bathed Mr. Epiglottis and headed down the Jimmysophagus too, having sweated off so many pounds each morning. 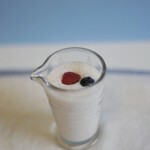 While I came to savor natural kefir, I did sometimes glug it with bites of those masticated peaches, or sweet Calimyrna Figs from the orchard encompassing our home. But now I must try your rhubarb kefir, Georgia. 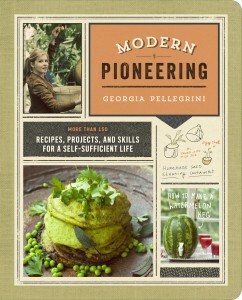 Perhaps I’ll make friends with our kitchen, surprise my bride of 30-some years, and work up a batch per your methods. Since boyhood, rhubarb-based treats have been on the order of a magic substance, placed before me with a twinkle by my precious, Thurberian mother. Oh, do it, do it! And be sure to tell me how it turns out. My Muddy Dog Coffee arrived today. One day earlier than promise and I can smell it right through the Fedex box! Wow! Let us know how it is! We drink kifir daily and I've been wanting to learn to make it. Thanks! 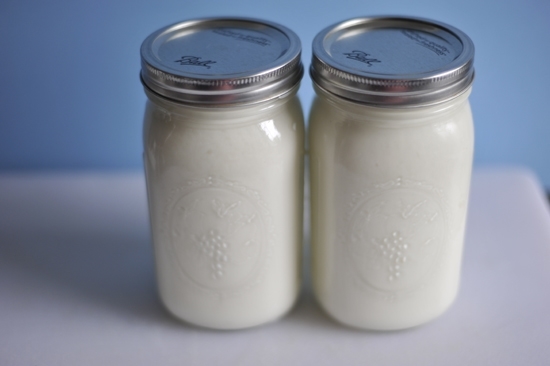 do you use the milk from fresh coconut or canned milk if you want to use coconut milk? and what about rice milk -same procedure? can you use almond milk? 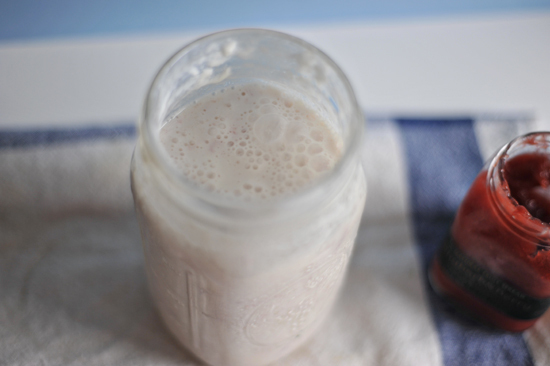 You can use almond milk. 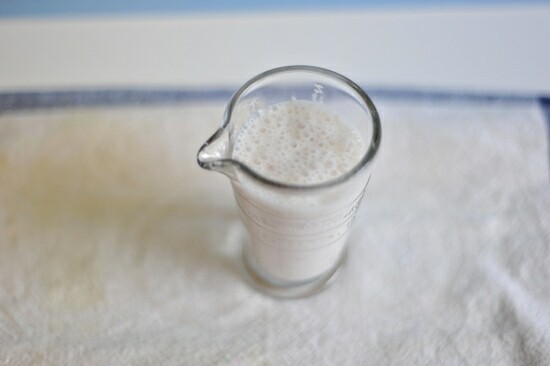 I've never made it out of coconut milk but I think the idea is for the milk to be as pure as possible with no additives. So whatever you find that matches that bill will be "good for you" keifr. The consistency will be very different than with dairy though. 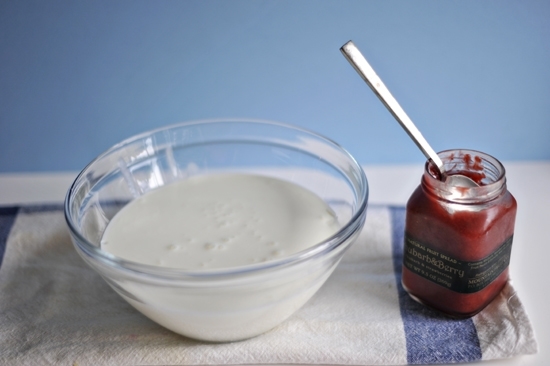 We make our own yogurt. It is the best-so tasty and much cheaper. I will have to try this next! 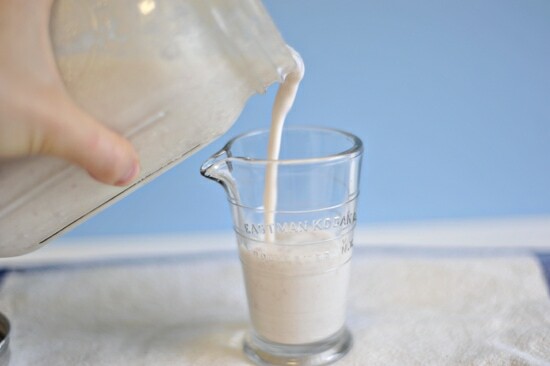 Kefir works wonders on my skin. The strawberry rhubarb version looks tasty! This looks fantastic! 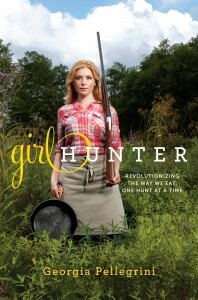 My sister is newly diagnosed Celiac and keifr is fantastic for her, she devours it! How fun to be able to make this yummy treat for her…even WITH her! What is the brand of the jam you used? The brand is Mountain Fruit Co. from California. They make wonderful jams.